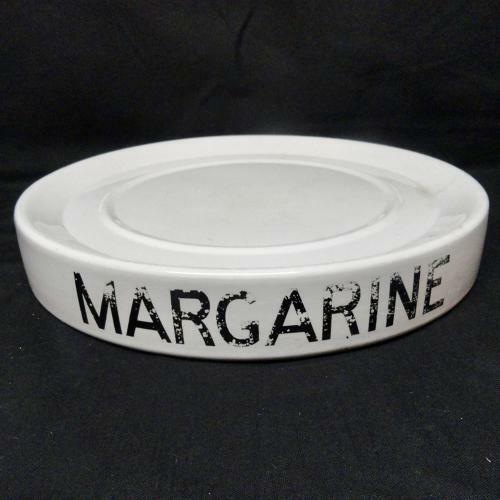 This large ironstone MARGARINE display advertising stand was originally used for displaying butter, margarine and other dairy products on the grocer’s shop counter. It measures 16 1/2” across and 2 1/2” tall and has a center well. The Dairy Supply Companies supplied grocers and butchers the slabs to offer a customer to purchase slices of margarine, cut off and sold. A sturdy stand was meant for the heavy duty trade use and easily adaptable to a country kitchen or a contemporary cheese and wine shop. The stand is in great condition with almost no wear other than the top of margarine rubbed off and a small hairline to the side only at the hand holes. A very heavy substantial piece.